After spending the first half of the month in a très bohemian little apartment off rue Montorgueil, I spend the rest of May hotel-hopping both in Paris and beyond, and exploring the city’s other quartiers. As I mentioned, I stayed in the tony first arrondissement near the Louvre and the Tuileries while at the Westin Paris, but I had another night here as well when I stayed at the recently opened Mandarin Oriental on chi-chi rue St. Honoré, where you’ll also find some of Paris’s fanciest shops. A few of the mouthwatering pastries at Angelina. 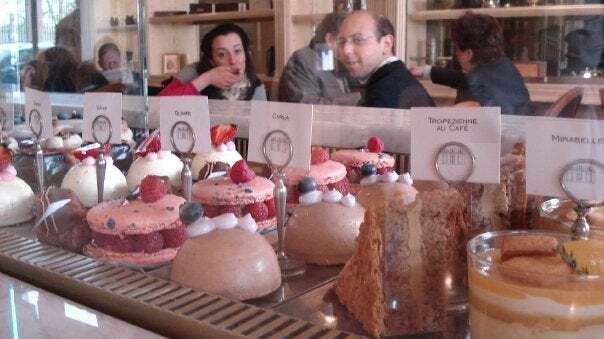 One of my other favorite things to do around this part of town is to go for hot chocolate and macarons at Angelina, a fancy 19th-century tea room on the rue de Rivoli. Some people prefer La Durée, but Angelina feels a little more authentic—though it’s always packed with tourists—and I love their signature Mont Blanc pastries with chestnut cream. To shake off the sugar coma, I usually take a stroll across the rue de Rivoli to the sunny Tuileries Gardens, and maybe a quick peek at L’Orangerie, a tiny museum annex to the Louvre at the other end of the Tuileries where some of the museum’s most famous Impressionist works are on display, including Monet’s famous tableaux of water lilies from Giverny. 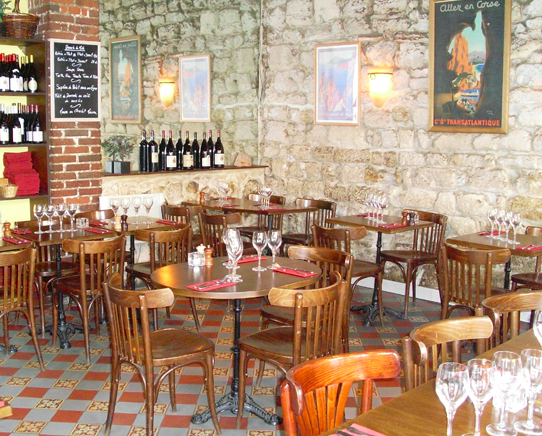 Nearby on the rue Montpensier near the Palais Royal, there’s a little wine bar attached to a restaurant called Verjus with a lovely selection of natural wines and delicious small plates, all in a tiny cellar. Great ambiance, lots of young people trying wines, talking, and making friends. A little farther east toward the Place des Victoires, I also tried another wine bar/restaurant called Les Fines Gueules in a gorgeous Belle Epoque building and with an interesting list of natural wines and a menu of seasonal dishes like Bretagne crab tartare with avocado and fresh tomato. 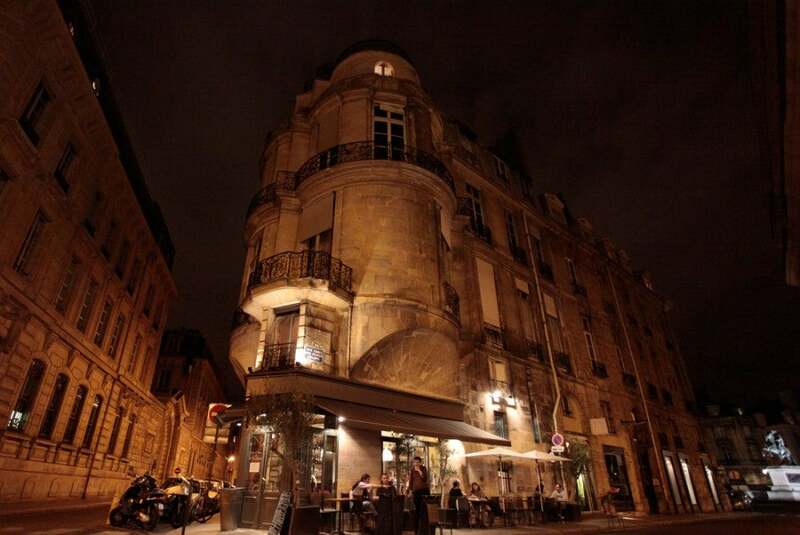 Les Fines Gueules, a delicious little restaurant just off the Place des Victoires. One of my favorite neighborhoods (and I’m not alone) is the Marais. This time I stayed in a couple different hotels around here, including a small serviced apartment on the rue des Mauvais Garçons (Bad Boys Street) and got to explore the area. I loved the trendy clothing and home boutiques on rue Vieille du Temple and rue du Bourg Tibourg, as well as the rue des Blancs Manteaux and rue Roi de Sicile (which become rue de la Verrerie). L'Alivi, a delightful little Corsican restaurant in the Marais. I also strolled along the rue des Rosiers, where the Jewish population of Paris traditionally lived and admired all the kosher bakeries and their pastries, stopped for falafel at L’As du Falafel and checked out some of the cute stores and art galleries popping up here. I also ate nearby at L’Alivi, a charming little Corsican restaurant called L’Alivi for a Mediterranean take on French cuisine that included crostini with savory eggplant caponata and melting dollops of creamy goat cheese. One evening after I went to the Centre Pompidou to see the collection of contemporary art at an exhibition on Matisse, I was walking along the tiny rue Quincampoix and found a tone of little art galleries holding artist openings with wine and cheese, and just wandered from one to another while munching canapés and sipping wine, and stopped for a light bite at one of the cafes in the semi-hidden Passage Moliere, a picturesque alley that dates to the 18th century. I love the 7th arrondisement—it’s quite an upscale district of embassies, imposing government ministries and fine old apartment buildings. I didn’t spend a huge amount of time here this trip, but it is also home to one of my favorite venues in Paris, the Musée Rodin, where even if you don’t feel like a full-on visit, you can still walk through the lovely gardens that surround it admiring some of the artist’s better known sculptures. 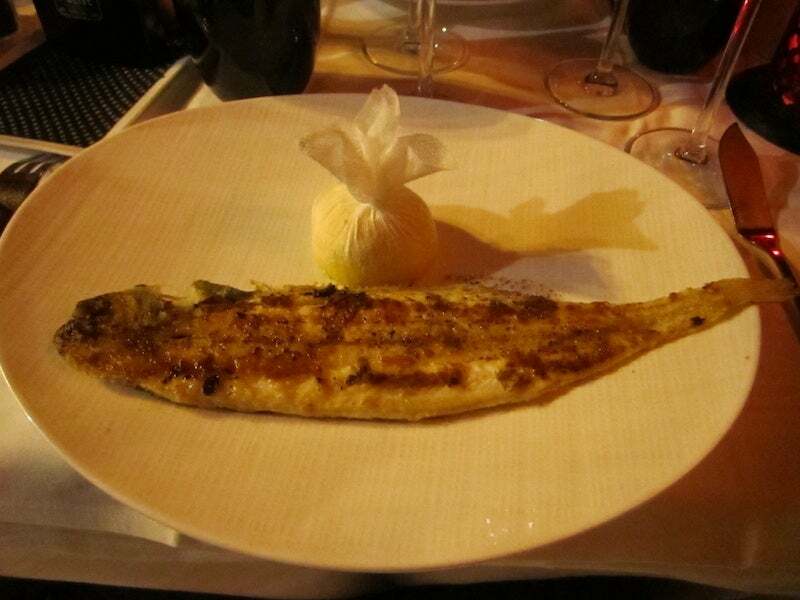 Classic sole meuniere at Bistro de Breteuil. I also got the chance to go back to a favorite little restaurant of mine—though I always get lost trying to find it, so be sure to take a map with you! 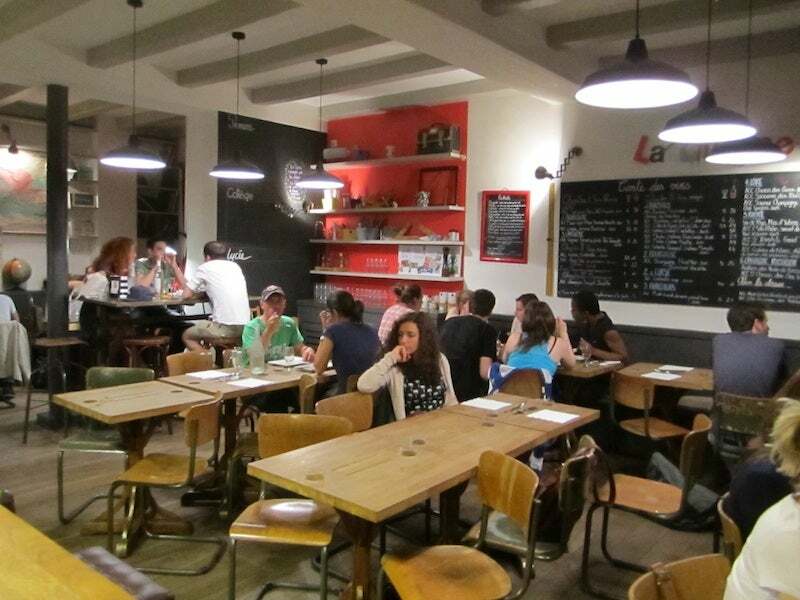 The Bistro de Breteuil is a well-kept little secret that’s actually tucked into a quiet corner of the 15th arrondisement near Les Invalides (though you’ll usually find a few American parties in attendance). Here you’ll find a very traditional French bistro experience where pretty much everything you order is part of the prix-fixe three-course meal including a welcome aperitif, one bottle of wine per two people, and all the dishes (though some of the ones with foie gras will have a supplemental charge). I kept it simple the night I went there, ordering a delicious lobster-avocado starter, a main course of sole meuniere (a French classic I love), and the Grand Marnier crepes complete with flames for dessert. The wines were nothing to write home about, but there were several choices, so it was easy to find something we all liked. This is the arrondissement of the Grand Boulevards devised by Haussman in the late 19th century when Paris was completely redesigned and transformed from a medieval warren of streets to a city of stately avenues. This is where you’ll find the 1875 Opera Garnier, a neo-classical 19th-century architectural overload with burnished golden statues and an enormous green dome. Inside, you can take a tour of the opera, learn its history and see its famous features like the huge multi-colored marble Grand Staircase, the famous chandelier that inspired Phantom of the Opera and the interior dome that was painted by Marc Chagall. 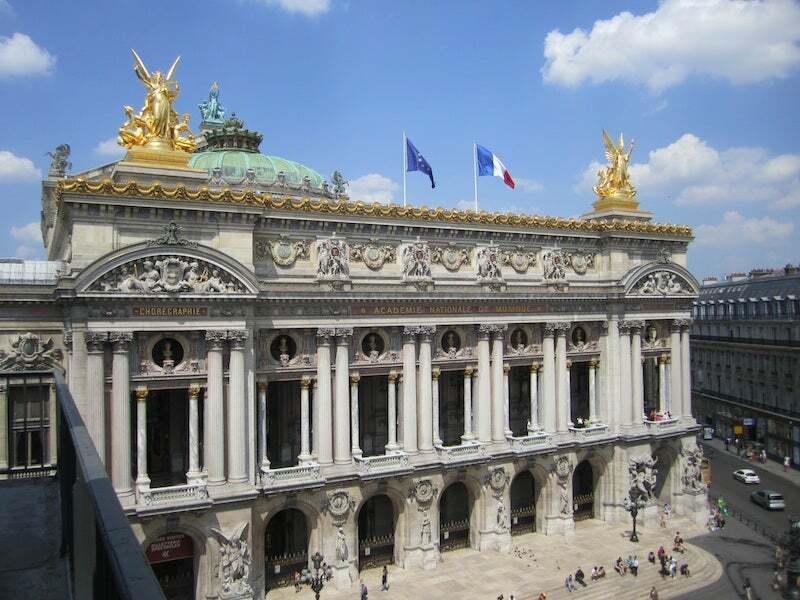 The recently restored over-the-top facade of the Opera Garnier. After your moment of culture, hit the famous department stores like Printemps and Galeries Lafayette, then take a break for a coffee and pastry at one of Paris’s most famous restaurants, the Café de la Paix…that is, if you don’t stop for lunch under the gorgeous Art Nouveau stained-glass dome at Café Flo on the top floor of Printemps. After that, stroll west toward Place de la Madeleine where you can pick up fancy souvenirs for your favorite foodies at stores like Fauchon (chocolate) and Maille (mustard, vinegar and pickles). 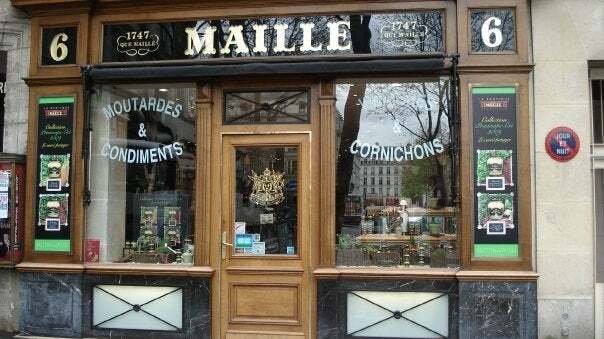 Pick up some fancy flavored mustards for your foodie friends back home at the Maille store on Place de la Madeleine. I actually stayed at a little hotel called the Hotel Jules on the eastern side of the arrondissement along rue Lafayette, and just went around the corner that evening to an adorable little bistronomy-style restaurant called La Classe on rue de Maubeuge where the tables were old-school writing desks, there were antique French maps on the walls, and the menu changes every evening according to what’s fresh in the markets. I enjoyed a delicious starter of eggplant “caviar” topped with a steaming poached egg and spooned onto crisp croutons, then a salad of fresh prawns and quinoa accompanied by a chilled white Sancerre and surfed the free WiFi after dinner to get some work done. The classroom-themed dining room at Classe in the 9th arrondisement. I didn’t actually get to spend much time in these two up-and-coming but still gritty arrondissements, but I did have a few meals here at some exciting restaurants. One evening, I stopped by Au Passage on a destitute section of alley in the 10th off Boulevard Beaumarchais near Place de la Bastille. 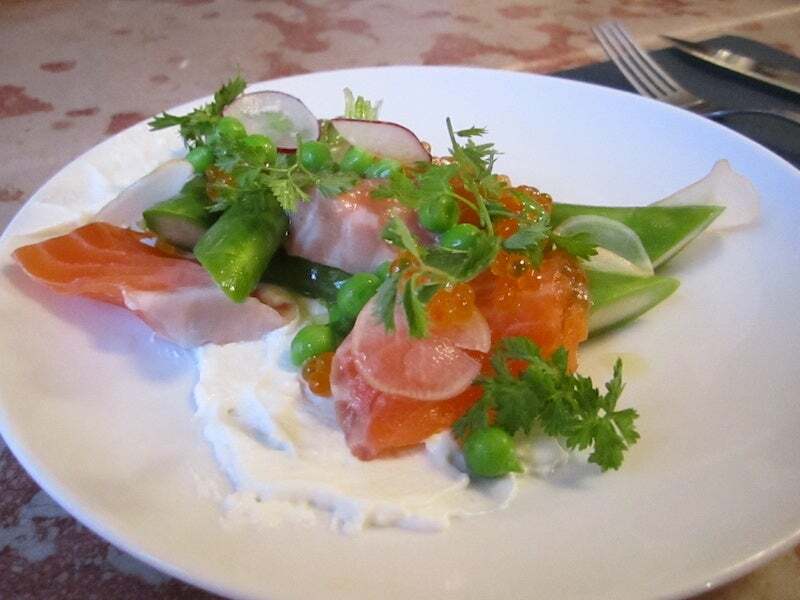 What the casual setting lacked in refinement and ambiance, it made up for in excellent, offbeat French wines by the glass as well as enlivening dishes like home-smoked trout with spring asparagus and crème fraiche. The house-smoked trout at Au Passage. One of my other favorite things to do in Paris is to spend a sunny morning strolling along the Canal St. Martin near Place de la Republique à la Amélie where Parisians come to read and sun themselves along the banks. There’s always a line to get into brunch at hipster favorite Chez Prune across the street, but just a block farther south is La Marine, a darling little brasserie serving delicious French dishes, with a prix-fixe lunch formule of 18 euros that’s hard to beat. Especially because of the prime people-watching on Quai Valmy along the Canal. 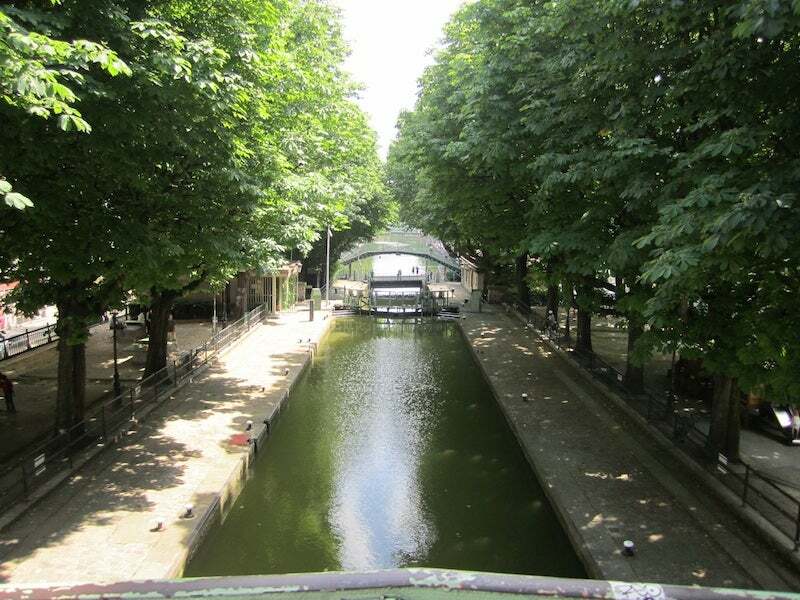 A sunny afternoon along the tree-shaded Canal Saint Martin - one of Paris's most picturesque neighborhoods. This was actually my first stop after the excitement of rue Montorgueil and the 2nd arrondissement because I spent a night at the Shangri-La right across the Seine from the Eiffel Tower on Boulevard Iena. Though I always thought of the 16th as a rather sleepy district (and it is home to a disproportionate share of Paris’s florists and geriatric population), I do enjoy the stately boulevards. It’s also quite handy to the Eiffel Tower (the view from my hotel room was incredible), the Bateaux Mouches river cruise boats which every tourist seems obliged to take upon a first visit to Paris (hey, I’ve even been on a fancy dinner cruise aboard the Bateaux Parisiens and had a great time). 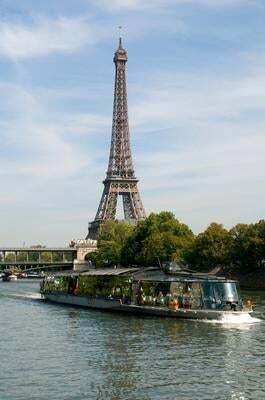 It may be cheesy, but it's still fun to take a river tour on the Bateaux Mouches. It’s also quite near two of Paris’s more interesting museums, the Musée d’Art Moderne in the Art Deco Palais de Tokyo, which has exhibits of some of the 20th centuries most influential artists; and the Musée du Quai Branly, with a fascinating collection of African, Asian, Native American and Pacific art as well as a vertical living wall garden designed by one of the world’s foremost landscape architect, Patrick Blanc. Looking back, it seems like I must have eaten at every restaurant in Paris (and racked up lots of double points by charging meals to my Sapphire Preferred), but in fact, there were quite a few I wanted to try that I just didn’t make it to this time including L’Atelier de Joel Robuchon, the Verre Volé and Au Comptoir. I guess I’ll just have to go back soon! What else did I miss? I’d love to hear reader favorites, as well as any other sights or museums you love to visit in Paris, so dites-moi!